1. Today (okay, technically tomorrow at midnight) marks the beginning of Will's block leave. Block leave is a glorious, beautiful thing. It means Will has sixteen days to do anything that is not even remotely Army related. Staying up too late playing XBox, enjoying a beer and a cigar late at night, not setting his alarm for 4:30am, not dealing with soldiers who thought it would be a great idea to get a DUI after leaving the bar, and NO PAPERWORK. For sixteen days. It will be awesome. 2. In other awesome-related news, the end of my pregnancy is rapidly approaching. Here I am, a day shy of 36 weeks. Of course my back doesn't feel like it's going to break in half...why do you ask? Not wanting to be left out, Tony demanded that Will take a picture of his belly as well. Will asked if he was pregnant like Mama. 3. My back, unsurprisingly, has gone from bad to worse. Or as my midwife put it, "You'll be crowning and you'll have your neurosurgeon on the phone, scheduling the earliest available appointment." Yeah, pretty much. 4. I'll confess to having a slight obsession with The Walking Dead, although I was less than thrilled with the turn the show took this previous season. I'm also slightly obsessed with baby wraps and carriers; specifically, Tulas. At this point, I really need someone to talk me out of hiring an artist to customize a Walking Dead Tula for me. I mean..I just think that would be the coolest thing ever. I would be the envy of every babywearing parent in Colorado. (Just repeat over and over..."it's not in the budget, it's not in the budget, it's not in the budget..."). 5. Speaking of zombies, I am once again reminded how poorly I would fare in the event of an apocalypse. We briefly lost power last week (and by "briefly," I mean like thirty minutes), and I grumbled incessantly about not being able to turn on any lights, get dinner started, charge my phone, etc. Talk about first world problems. I am hopelessly spoiled, and if I'm being honest, pretty hopeless in general. I have no idea how my ancestors did it. 6. Is it bad that I have to bribe my children with doughnuts as a reward for good behavior at Mass? Our parish ever so thoughtfully provides coffee and donuts every Sunday following Mass, and naturally Tony and Alessandra want in. We've had to skip the doughnut tradition every now and then due to wretched behavior during the homily, and man that is one painful car ride home. I'd like to think I'm not the only parent who takes away the promise of sugar as a result of bad behavior...but I think we all know by now I have embarrassingly low standards. 7. While we're on the subject of low standards, what are the odds that Will can sneak a margarita past the nursing staff at the hospital once I give birth? Purely hypothetical question. 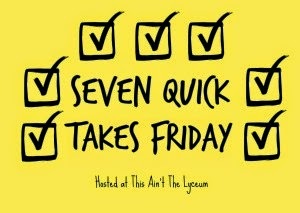 For more Quick Takes, visit Kelly at This Ain't the Lyceum! Ugh I'm sorry to hear that. :( At the same time, I'm glad it's not just my children! 36 weeks!!! didn't that fly by??!?!? I'm 40 weeks today!! We will both be meeting our new littles soon, super exciting!